Last month, Ron Hruska was interviewed by a physical therpaist colleague, Paul Potter, and the podcast interview is now available online. To listen to Ron's input on "Three Keys to Creating Your Dream Practice", CLICK HERE! You can also download the podcast on iTunes as well. I spent time in Chicagoland teaching Impingement & Instability. I was so pumped by the end of this past weekend because the group was switched-on, the room was electric and the exchanges were dynamite! Reference Centers ruled the days and several folks found some new neurological pathways for solutions to plaguing issues. Tim-inhibit those TFL's, Deb- breathe! !, Liz- R Glute max for your daughter, Barb-R subscapularis and Bill...I'll just keep taking notes brother!! PRT Application Deadline - October 15th! It's officially Fall, which means that the Postural Restoration Trained (PRT) application deadline is quickly approaching. If you are interested in applying, applications must be received by October 15th. CLICK HERE to find out more information about the PRT credentialing program. If you have any questions, please feel free to email me! "It was one of the most meaningful two days that I have ever had! Thank you guys so much for providing us this opportunity." "Everything was great! Really good stimulated critical thinking and application of the information. The two days flowed really well and built off of everything before it. The application process was a great learning experience in itself." "While the application process was quite rigorous, it sets a high standard and I feel confident with my colleagues' passion, intellect and knowledge regarding PRI. The credentialing process was a complete joy and an additional learning process!" Course in Review - Montreal, QC! We had a great time in Montreal this past weekend with Pelvis Restoration. We had an integrative room full of healthcare practitioners with various backgrounds. I feel by the end of the weekend, they appreciated the importance of a hemi-pelvis and frontal plane control of this hemi-pelvis during left stance and /or right swing phases of gait.I also felt an improved understanding of how important the pelvis is to truly integrate the body. I thoroughly enjoyed “coaching” these individuals and feel blessed to have spent the weekend with each of them. Here’s a picture of us taking our hats off to Ron Hruska in our extended hyperinflated state! 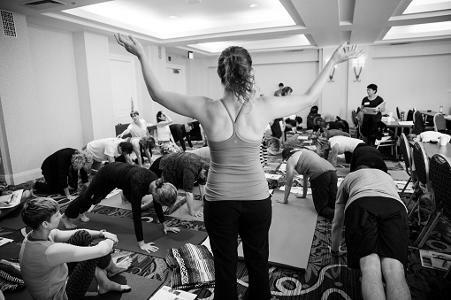 PRI Integration for Yoga - Course in Review! When James Anderson asked me if I thought there would be interest in a PRI Affiliate Course for Yoga one year ago, neither of us would have believed that it would bring together 60 people for the first course. Participants came from all across North America representing various health, fitness, and coaching professions. Over 1/3 of the participants were yoga instructors (including James' wonderful new wife Karen) with no formal PRI training prior. Welcome to PRI Nation, yogis! We dove right in Saturday morning with James presenting his Affiliate Course overview of PRI. The audience gained appreciation for PRI's unique -and asymmetrical- platform and our un-waivering respect for neurology, respiration, and biomechanics. By specifically highlighting how the Left AIC and Right BC patterns impair ZOA, gait, and availability of motion, he began the conversation on how yoga can equally optimize or minimize an individual's neutrality. After lunch, I introduced the PRI Yoga Screens, PRI Yoga Awareness Sites (PRIYAS) with a hat tip to Impingement & Instability Reference Centers, and key PRI Opposition Muscles to be mindful of in yoga. I hope that these screening tools will empower yoga teachers to feel confident in understanding the outcomes of their intervention as well as provide the basis for a referral to -and clear communication with- a PRI clinician. These screens introduced non-clinicians to the A-B-A world of PRI and will undoubtedly demonstrate the value of PRI Yoga to their clients. The PRI Assessment Poses are yogic manifestations of the Hruska Adduction Lift Test and proved to be playful ways of finding the PRIYAS hidden in the poses. Throughout Sunday, we explored PRI Yoga poses (asana) in movement labs interspersed throughout the day. I taught asanas that emphasized one or integrated all three planes of movement. I especially loved sharing Bollywood and Warrior 3 as they are equally inspired by yoga's birthplace and by PRI non-manual techniques; they also optimize late left stance and early right stance respectively. We modified the traditional movement sequences of the sun and moon salutations with many students feeling more neutral after just one round. Next, we focused a new PRI "P" word with pranayama or breathing practices that attained and maintained the ZOA. In closing, I offered recommendations on sequencing a yoga class to parallel a PRI treatment progression and provided PRI Yoga interventions based on potential PRI Yoga Screen outcomes. It was a full weekend marrying the complementary aspects of PRI and Yoga. We received gracious feedback and look forward to offering it again next year with some of the first-time glitches fixed. This course brought together two vast bodies of knowledge and left all of us in awe of the similarities and the breadth of these healing paths. I am humbled and honored to share it with you all. You can also visit Shine Integration Physical Therapy's website and the Postural Restoration Integration for Yoga Facebook page for more photos and course review. Namaste'! 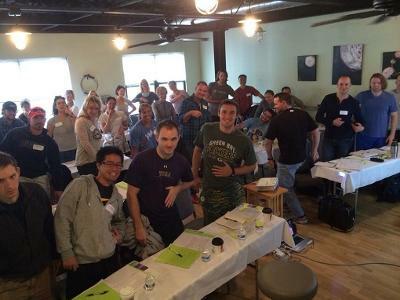 I had a great time teaching my last Myokin course of 2014 in Canton CT this year. It was so nice to back in New England in the early Fall. I miss my NE roots, but love our new life in NC! I had the opportunity to engage and enlighten a room full of professionals that were equally excited to learn the science of PRI. We were once again represented by a diverse group of professionals from PT’s, ATC’s, MTs, Personal trainers and fitness professionals. Paula and her staff at Canton PT were amazing hosts with a beautiful warm clinic. This course filled and had a wait list! I am sure the PRINATION will continue to grow in this area. I had fun with my front row of students. They kept me laughing and on my toes all weekend long! We all appreciated the importance of parasympathetics and balancing not only our pelvis’s but our lives! Until we meet again, Myokinematics….See y’all in 2015! We are pleased to share the exciting news that James Anderson and Karen Bradford were married on September 6th, 2014. The celebration took place in the mountains near St. George, Utah with a guest list that included Ron and Robin Hruska, Raulan and Amy Young, and Minh Nguyen. Congratulations to both of their families as they begin their lives together. Looking forward to the PRI Vision Integration for the Baseball Player course after seeing the materials that will be covered. The introduction of the PRI vision concepts into our player progressions have been a powerful adjunct, and a missing piece, for some of those hard to crack cases. Getting an apprecation for space in a sport that is constantly looking for more visual focus has allowed some of our players to get into a position of transition and reciprocation that they were previously unable to attain. Remaining 2014 Courses & 2015 Schedule! Many of our remaining 2014 courses are full, and others are filling up quickly! If you are hoping to attend a course yet this year, and have not signed up, I would be sure to do so soon if seats are still available. As we are nearing the end of the year, we have begun adding 2015 courses to our online schedule! Courses are being added to the website daily, so be sure to check them out. We hope to have the schedule completely finalized over the next month, and the 2015 brochures will be sent out the first week of December! 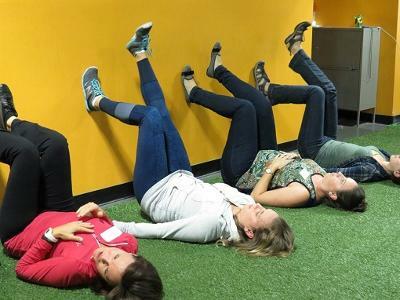 Emily Soiney emailed this gem of an article (which she found while putting together the PRI Integration for Yoga affiliate course) to both Ron and I last week, and I can honestly say that Ron probably hasn't slept the same since then! If you are interested in reading more about lateralization related to the CNS and ANS, be sure to print this article off and add it to your must read list!